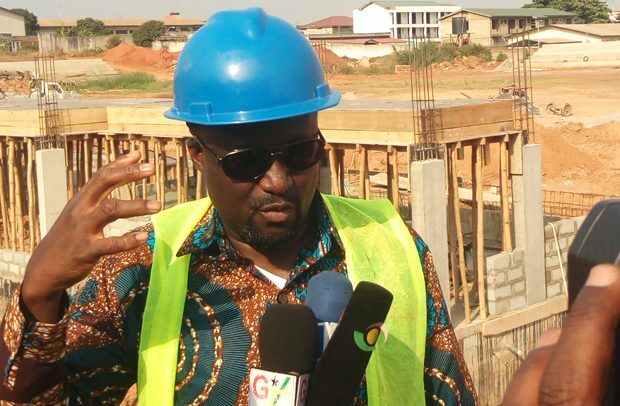 National Youth Authority (NYA) boss, Emmanuel Asigri, has praised Issah Gariba, contractor for the Kaneshie Sports Complex profusely for his resilience despite technical challenges at the site. Kaneshie (Azumah Nelson Complex) is one of the venues for the Multipurpose Sports Centres of Excellence dotted across the country aimed at providing a conducive platform for the youth in the country. But unlike the remaining nine centres, the Kaneshie venue is slightly behind schedule due to the pulling down of the old VIP stand and the relocation of major pipelines. Notwithstanding that, the contractor and his team have progressed steadily and are most likely to finish ahead of schedule. That stirred the NYA chief to commend the contractor highly after the facility tour last Thursday staying “l must commend the contractor highly for a good job done, you know my office is just here so l come around every morning to ensure that the work goes on. You know this venue is not like the other nine centres. The pulling down of the old VIP stand constructed in the 70s alone was enough work, we also discovered that the pipe lines supplying most part of Accra ran through the site; and it burst along the line making work at the site extremely difficult. So far, the Youth and Sports Minister, Isaac Asiamah, and the NYA boss have inspected nine centres comprising-Volta, Eastern, Western, Central, Ashanti, Upper West, Upper East and they are expected to inspect the Yendi centre in the Northern Region in the coming days.